Last month, the Centers for Disease Control and Prevention (CDC), the American Cancer Society (ACS), and the Association of American Cancer Institutes (AACI) announced the 2018 HPV Vaccine Is Cancer Prevention Champion Award winners for outstanding efforts to protect adolescents from cancers caused by HPV. The award recognizes clinicians, clinics, practices, groups, and health systems that are going above and beyond to foster HPV vaccination in their community by achieving high HPV vaccination rates. Every year, the award honors up to one champion from all 50 U.S. states, eight U.S. Territories and Freely Associated States, and the District of Columbia. Of the 32 state champions honored this year, nine of them practice in rural communities. These champions came from Arkansas, Delaware, Georgia, Indiana, Maine, South Carolina, Tennessee, Vermont, and Wyoming. Every year in the United States, more than 33,000 women and men are diagnosed with a cancer caused by HPV infection. HPV vaccination could prevent more than 90% of these cancers—about 31,000—from occurring. CDC recommends two doses of the HPV vaccine at ages 11-12. However, only five out of ten adolescents have received all the recommended doses of the HPV vaccine. While HPV vaccination rates have been increasing in recent years nationally, recent CDC data show that fewer adolescents in rural areas are getting the HPV vaccine compared to adolescents in urban areas. In 2017, the percentage of adolescents who received the first dose of the HPV vaccine was 11 percentage points lower in rural areas compared to urban areas. This year’s Champions are being honored for their leadership, collaboration, innovation and commitment to the adolescent patients in their communities by implementing strategies to increase their HPV vaccination rates. To learn more about the 2018 HPV Vaccine Is Cancer Prevention Champion award winners and how they achieved high HPV vaccination rates, visit https://www.cdc.gov/hpv/champions/index.html. 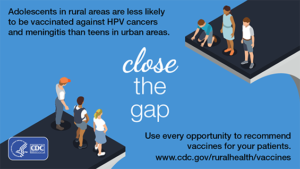 CDC also has resources designed to help clinicians in rural communities effectively recommend HPV vaccine, answer parents’ questions, and implement strategies to increase HPV vaccination rates in their office. To find these resources and to learn more about the latest data on HPV vaccination rates, visit: https://www.cdc.gov/ruralhealth/vaccines/index.html.